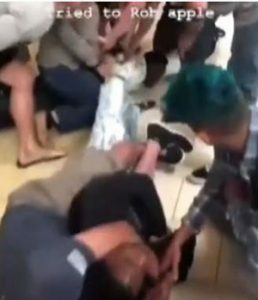 Ventura County – Helpful customers recently tackled two thieves at an Apple store. Retail Apple stores are usually pretty busy places. Customers swarm through the open spaces ogling the glowing displays of high-end computers and electronic items. “Apple geniuses” do their best to answer the constant flow of random questions from patrons. In making their hasty exit, however, they knocked a female juvenile customer to the ground. Then other customers responded in kind and “tackled two of the suspects and detained them” until responding Thousand Oaks Police Department deputies showed up. Less than half an hour later, however, a VCSD patrol unit conducted a routine traffic stop on a car speeding through Simi Valley. Inside the vehicle the cops made contact with 23-year-old Sacramento resident Mona Benoit (Shakyizia),Antioch resident 23-year-old Edward Benton, and 26-year-old Fresno resident Tynisha Noel. Inside the car they found iPhones and other Apple devices. These came from the Oaks Mall Apple Store and another Apple store in Los Angeles. Investigators think all five operated as an organized retail theft crew. Law enforcement booked them into Ventura County Jail on charges of burglary, criminal conspiracy, and possession of stolen property.